Has you may have noticed. WP-Buddy.com has relaunched with a new (homemade) WordPress theme based on the popular _s starter theme. So why have I switched to a self-made theme instead of using a free or paid theme? I think we can not really write about the lack of theme functions these days. Unfortunately this is the problem that I personally have with current themes. A) They have so many functions that I just don’t need. And B) because of these functions the theme is overloaded when it comes to CSS and JS. 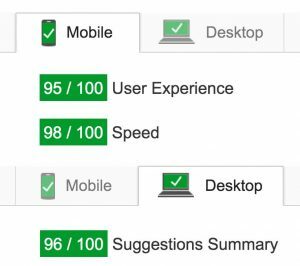 This leads to another problem: it’s really difficult to get a very (I mean a really good) score with Google PageSpeed Insights. Too many (maybe unused) CSS files. Too many (maybe unused) JS files. Difficult to get a really good PageSpeed Insights score. As mentioned above I have used the Underscores starter theme that Automattic provides. Above the fold: only the stuff that is currently in the users viewport is loaded with the first request. All other CSS and JS files will be loaded asynchronously. I integrated as much schema.org as I could. You can watch this on Googles Structured Data Testing Tool.